Cash is King, D.J. 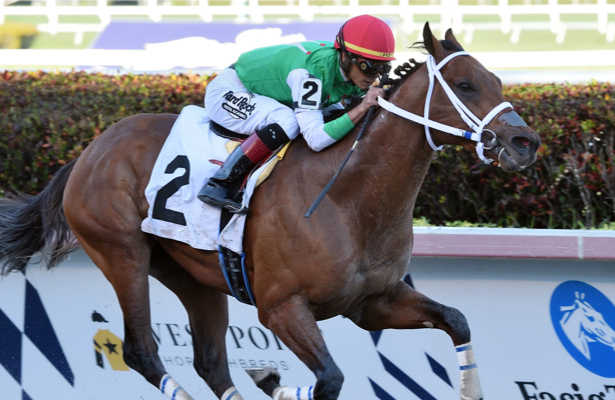 Stable and LC Racing’s multiple stakes winner Diamond King made a triumphant return to the races Friday at Gulfstream Park, stalking pacesetter War Giant before drawing off through the stretch in the featured ninth race. Narrowly favored over two-time graded-stakes winner Avery Island, making his first start in nearly 14 months, Diamond King ran one mile in 1:36.38 over a fast main track in the $52,000 second-level optional claiming allowance for 4-year-olds and up. It was the fifth career win for Diamond King, a 4-year-old son of Quality Road that won the Heft Stakes at 2 and Federico Tesio Stakes at 3, both at Laurel Park. The latter earned him an automatic berth in the Preakness (G1), where he ran seventh behind eventual Triple Crown winner Justify. Following the Preakness, Diamond King finished fifth in the Ohio Derby (G3), second in the Smarty Jones (G3) and third by a head in the Oklahoma Derby (G3) Sept. 30 to wrap up his sophomore campaign for trainer John Servis. In Friday’s race, jockey Jose Ortiz positioned Diamond King at the right hip of War Giant as the 11-1 long shot sent a quarter-mile in 23.57 seconds and a half in 46.43. Avery Island tracked in third down the backstretch but began to fade as the field reached the turn. Diamond King straightened for home in command and sprinted clear to give jockey Ortiz his third win of the day. Eye of a Jedi got up to be second, with Hy Kodiak Warrior third. Avery Island finished seventh of eight.